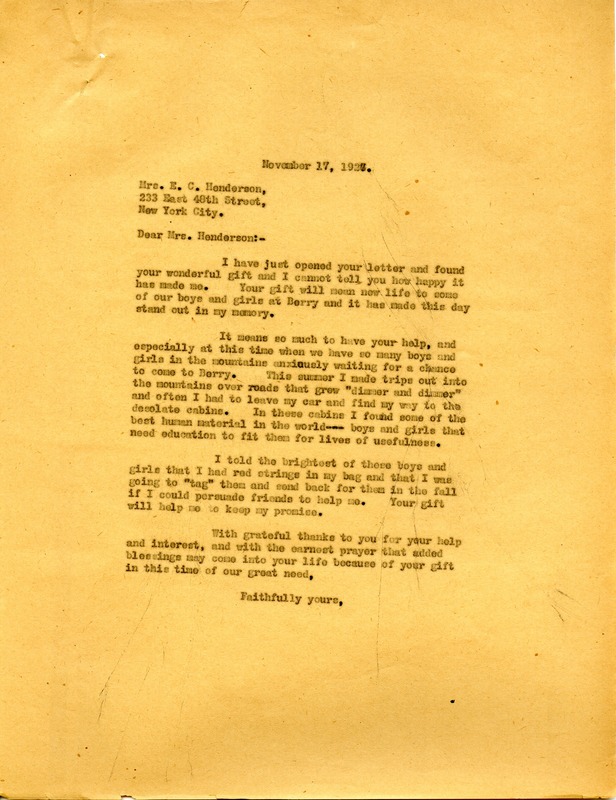 This is a thank-you letter from Miss Berry to a woman named Mrs. Henderson for her generous gift. Miss Berry tells her what her money is going towards: fulfilling a promise of education to some boys and girls she met in desolate cabins in the mountains. Miss Martha Berry, “Letter to Mrs. Henderson from Miss Berry.” Martha Berry Digital Archive. Eds. Schlitz, Stephanie A., Jessica Hornbuckle, Rachel Renaud, Hannah Bailey, et al. Mount Berry: Berry College, 2011. accessed April 25, 2019, https://mbda.berry.edu/items/show/339.